“The Flesh Ripper Brutes won’t be able to reach us up in that cavern.” The Citadel Guards climbed and scrambled into the pitch-dark space and paused in the entrance, catching their breaths before turning to look into the darkness. Three pairs of glowing red eyes were glaring at them. Before the guards could shield themselves, three pairs of claws were digging into their flesh. Armed with deadly claws and uncanny speed, the batlike Razorwings are among the most terrifying predators of Terrrinoth. 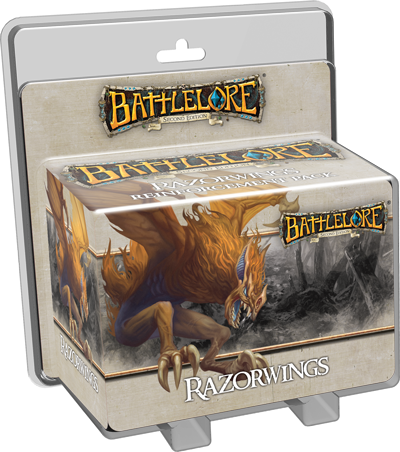 Bring these ruthless monsters into your BattleLore Second Edition army with the Razorwings Reinforcement Pack. 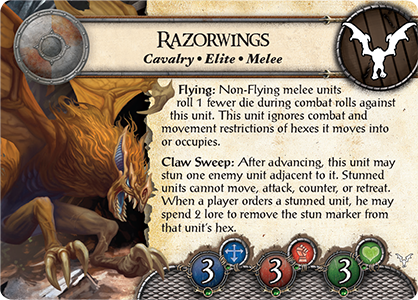 You can muster the wild Razorwings in a deployment for any faction and surprise your opponent by unleashing these surprising, swift, and ferocious beasts in battle. Inside the Razorwings Reinforcement Pack you’ll find more than the three sculpted plastic Razorwings figures and the cards you need to deploy this unit. 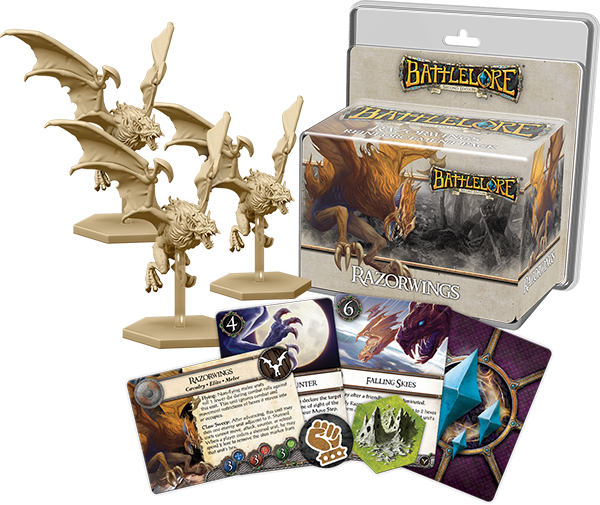 A new cavern hex terrain tile brings a new element into the BattleLore landscape, three new lore cards enhance the abilities of your entire army, and an innovative pre-built scenario introduces a day and night mechanic, creating new challenges for the Daqan and Uthuk Y’llan armies. Razorwings are nocturnal predators who spend the daytime lurking safely in their darkened lairs. Once night has fallen, they emerge and swoop over the landscape in search of quarry. They then plummet down upon their unsuspecting prey, sometimes instantaneously rending victims limb from limb, other times stunning them first so that they cannot fight back. The range of these soaring savages equals that of a Roc Warrior, and they are as formidable in combat as a unit of Flesh Ripper Brutes. 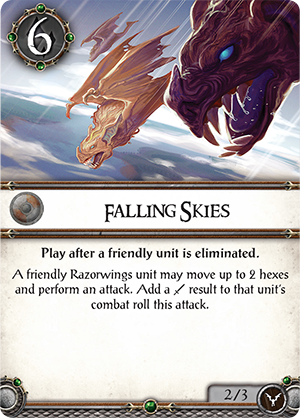 The Falling Skies lore card makes these vicious beasts even more fearsome, allowing them to exact revenge after a friendly unit is slain and ensuring that they’ll strike at least one blow. Cavern hexes bring the Razorwings’ lair to the battlefield. When you muster the Razorwings, you can replace one hill anywhere on the board with the cavern hex. Units on the cavern hex are shielded from ranged attacks by archers, Blood Sisters, or Battlemages. If you want to eliminate the Razorwings while they’re hiding in their lair, you must come close enough to that lair for them to fight back. With the Hidden Threat lore card, Razorwings gain incredible strength for defending their lair. 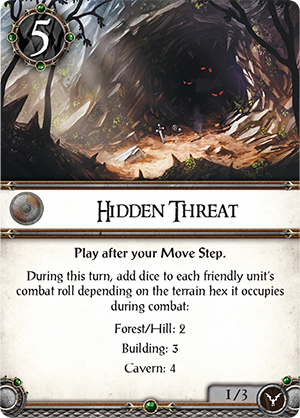 This card adds dice to the combat rolls of any friendly units on forest, hill, building, or cavern hexes, giving four additional dice to units in caverns. Only the most fearless troops would dare approach a cavern filled with Razorwings who use seven dice in battle. The Razorwings Reinforcement Pack, like the Great Dragon and Mountain Giant Reinforcement Packs, features a pre-built scenario that showcases the abilities of the new unit. Pre-built scenarios transform the entire battlefield, introduce unique setup conditions, and provide clear objectives for both sides. 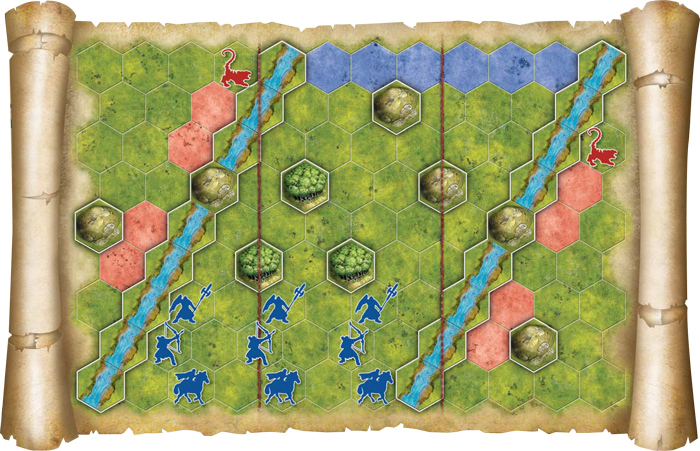 In A Shot in the Dark, the scenario of the Razorwings Reinforcement Pack, the battlefield becomes a narrow, river-bordered channel through which the Daqan must pass on their way to a safe haven. The Uthuk Y’llan threaten them from either side, and a colony of Razorwings, hungry for human flesh, haunts the battlefield. Night and day alternate as players take turns. During the night, the Uthuk Y’llan army makes its move and the Razorwings emerge from their cavern to attack the Daqan, only to disappear completely at the break of day. Night’s darkness clamps down upon line of sight, so that the Uthuk Y’llan must move in to attack and so that Yeomen Archers and other Ranged units cannot fire upon Razorwings before the creatures descend upon them. Even worse, if the Daqan damage or eliminate a Razorwings unit, at nightfall another full-strength Razorwings unit appears to assault them. The Razorwings bring to your armies a panoply of stunning new tactical possibilities. Terrorize the Uthuk Y’llan from above by mustering the Razorwings alongside a massive Roc Warrior in your Daqan army, or combine their sudden strikes with incredible ranged firepower of the Greyhaven Battlemages and Siege Golem found in Hernfar Guardians. Create a Uthuk Y’llan army full of bloodthirsty creatures by uniting the speed of Razorwings and Flesh Ripper Brutes with the Doombringer of Warband of Scorn. These fierce predators will hunt down your enemies with unprecedented ruthlessness and suprise them with stunning, lethal strikes. The hunt begins soon. Pre-order your Razorwings Reinforcement Pack today!